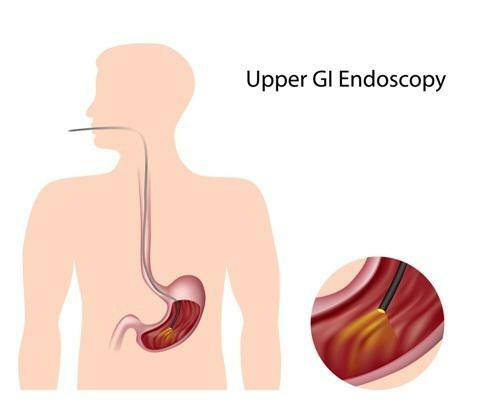 An EGD is an outpatient procedure that allows a GHP physician to examine the lining of the upper digestive or gastrointestinal (GI) tract (the esophagus, stomach and duodenum) with the use of an endoscope (a thin flexible tube with a camera that produces live video images on a monitor). An EGD is done to evaluate persistent symptoms of abdominal pain, nausea and vomiting, or difficulty swallowing, and to find a cause when bleeding from the upper GI tract is suspected. With an EGD, not only can the abnormalities be seen, but therapy can be administered through the endoscope. For example, instruments can be passed through the endoscope to treat bleeding, removed polyps, obtain a biopsy (a small piece of tissue), stretch (dilate) a narrowed area (stricture) and place feeding tubes for nutrition. Before undergoing EGD, Louisville GI Doctor William Evans will go over some pre-operative instructions that you will need to follow in the days before your procedure. Following these instructions is essential to limit surgery risks and provide the best results. Stop certain medications. Prior to surgery, your GHP physician and their staff will need to be made aware of all medications that you are taking, especially blood-thinning medications. These may include Coumadin (warfarin), Plavix (clopidogrel), Xarelto (rivaroxaban), Pradaxa (dabigatran), Eliquis (apixaban) and Lovenox (enoxaparin). Since the use of these medications increases the risk of excessive bleeding, they should be stopped prior to your procedure. If you are using insulin, the dosage or timing will need to be adjusted the day of the procedure. Doctor-prescribed aspirin may be continued before your procedure. In addition, your physician asks that you provide them or their staff with a list of medications to which you are allergic. Stop eating hours beforehand. Refrain from eating anything starting at midnight before your procedure is scheduled. EGD is performed as an outpatient procedure. Upon checking in, you will be escorted to the “pre-op” area where an IV will be placed and nurses will take down your medical information. At this time, you will also meet with an anesthesiologist to discuss the sedation used for the procedure. You will then be taken to a procedure room and connected to monitors that will monitor your blood pressure, heart rate and blood oxygen levels throughout the course of the procedure. Once this is finished, you will then be sedated for the duration of the procedure (not awakening until after it is complete). The procedure itself takes an average of 10-15 minutes to complete, and is painless because you will be asleep for its duration. To prepare for the procedure, you will be placed on your left side, and a “bite block” will be inserted into your mouth (to prevent the endoscope from damaging your teeth as well as to prevent damage to the scope). The endoscope is then passed through your mouth and the exam is performed. After the EGD, you will be returned to the “post-op” area to recover from sedation. During this time, you will be monitored for any potential complications from the procedure and/or sedation. When you are fully recovered, your GHP physician will give you an explanation of the findings from the procedure (this report is preliminary, however, and it may take several days before the final results of the biopsies or information regarding the polyps removed are complete). Along with the findings, your GHP physician will provide you with a copy of the procedure report, patient information handouts and follow-up instructions. Due to the effects of sedation, patients are instructed not to drive, operate machinery or make important decisions for the 24 hours following your procedure. You will need to arrange for someone to drive you home after surgery. You will be able to eat after you leave the hospital, unless instructed otherwise. The nursing staff will review these and other important post-op instructions with you prior to discharge. Bleeding can occur at a biopsy site; this is usually a minor complication and will stop on its own (or can be stopped during the exam). Rarely, more severe bleeding can occur depending on the treatments administered during the EGD. A rare but major complication is a perforation, or tear, through the lining of the intestine. If this occurs, it is managed with hospitalization, IV fluids, and antibiotics to prevent infection, and bowel rest in the majority of cases. However, some perforations may require surgery to repair. Uncommon risks from sedation used for EGD are: reactions to sedation medications, possible aspiration of stomach contents into the lungs and complications from heart and lung diseases. Although complications are rare, it is important to recognize them early. Contact the Gastroenterology Health Partners’ office if you notice severe abdominal pain, fever and chills, difficulty swallowing or black, tarry stools.